Brand New Wallenstein BX42 3-Point Mounted Self Feeding Wood Chipper. * The BX42's Capacity is good for up to 4" diameter Timber or up to 10" wide Dimensional Lumber. * The BX42 comes Complete and Ready to use including the PTO Shaft and even a pair of Safety Glasses! * The BX42 has 4 Double Sided, presharpened Rotor Blades and 1 Stationary Blade. * Both the BX42 and the BX62 have hinged Hoppers. This is very accomodating of Storage and Transportation. Plus, the BX42 & BX62 can easily be converted to a Hydraulic Roller Feeding Chipper simply by replacing the Standard Hopper with a Hydraulic Roller Feeding Hopper. Switch Hoppers with the 2 Hinge Bolts and you have a new machine! * 4 Colors are available: Red, Blue, Green & Orange. * This Listing is for a Red Chipper. * Although we always have BX42's in Stock, the Inventory colors "may" vary! * Specific Color ordering "may" be subject to delays. * More data is provided in the Specification Table below. NO SALES TAX ON OUT OF STATE SALES! Four Hardened Tool Steel Knives are designed to draw material into cutting chamber. Double Sided Stationary and Rotor Knives double time between sharpenings. Discharge hood rotates 360 degrees. * Wallenstein BX42 has 5 Blades (1 Stationary & 4 Rotor Mounted)! * DR Has Only 1 Rotor Mounted blade. * Wallenstein BX42 Rotor Weighs 110lb's! * DR Rotor Weighs 35lb's. * Wallenstein BX42 has Double Edged Knives! * The DR has single edged knives. * Wallenstein BX42 Chipper Weighs 475lb's! * DR Rotor Weighs 205lb's. * Wallenstein BX42 Discharge Chute has about twice the heigth available! * DR Top Discharge Chute has very limited heigth. * If you're dumping on the ground, the discharge chute heigth may not matter, but if you're discharging into a Wagon, Pick Up Bed, Trailer, etc, you wont need to keep shoveling the pile back with the taller & adjustable Discharge Chute of the Wallenstein BX42. * Wallenstein BX42 Discharge Chute rotates 360 degrees as well as having an adjustable Tip! * DR Top Discharge Chute has a stationary Chute and only an adjustible Tip. * Wallenstein BX42 Chips 4" diameter Timber and 10" wide Lumber! * The Dr is rated for cutting 4-1/2" diameter material, without a dimension for Lumber. 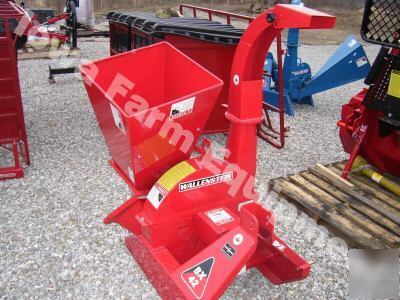 * Wallenstein BX42 has a large 20" X 20" Hopper (Intake Chute) Opening! * The DR's Hopper is only 9" X 13". * Wallenstein's Hopper is Hinged for Storage & Transportation convenience, PLUS, it can easily be replaced with a Hydraulic Roller Feeding Chute! * DR hasn't any features like this! * Wallenstein BX42 has a Very Heavy Duty 3/8" Thick Hitch on a 3/16" Thick Support (Made From Carbon Plate Steel) that your Tractor wont bend out of shape, PLUS, it is Quick Hitch Compatible. * The Dr's 3 Pt hitch is made with thinner guage sheet metal - No Comparison to the BX42. Compare To the DR Chipper; For info about the Jinma Chipper go to the 'TractorPoint' site then type "Jinma" in the Topic Search Window (Upper Right Hand corner of the page) and read the reviews - and certainly read the raving reviews about the Wallenstein's & GME's that we sell with confidence!